Cannas are easy to grow and in this article we show you how to plant, grow and divide canna lilies. These wonderful flowering plants are actually not a lily at all. Cannas are the genus of Cannaceae, they are closely related to heliconias, bananas and gingers. They are a excellent choice for tropical gardens, cottage garden, ponds and large pots, heights range from just under one meter to 3 meter tall giants, they are easy to grow very hardy plants that are suitable for a full sun position though they will get by with a minimum of 5-6 hours of sun. Very drought tolerant once the rhizome has established, some will survive only on natural rainfall. The flowers on cannas are called staminodes their true petals are very slender and can be seen on closer examination behind the flower. Usually the Stamen and Labellum show more brighter coloring to attract bees and other insects. If you apply a thick mulch and give a deep watering weekly or so you will achieve out standing results in height and many flowers as each stem will produces multiple flowering heads just how many depends on the cultivator, generally this ranges from 3-8, I have one cultivator that has produced 11 heads on one stem it has been flowering continually for over 7 months. With variegated and bronzed foliage cannas their foliage color is more intense when given some shade from the harsh afternoon sun, color will slightly fade in a full sun position. Cannas grow from a underground rootstock known as a rhizomes that continue to multiply, different cultivators produce varying sized and colored rhizomes, some are huge others are slender and long, short cultivators are usually small and compact, and for some growth is contained only as a tight side shoot. 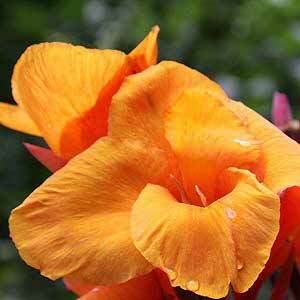 When planting cannas they will thrive in a well prepared soil -rich with some old organic manure and mulching. To plant place rhizome with eyes -new growth pointing upwards . Cover the rhizome with soil, firm down. Cannas also go very well in large pots with ample fertiliser. There are a few true aquatic/water Cannas and these are suitable for submerging in ponds or as marginal in a damp boggy position. Pruning old flowers is not essential, to tidy up old finished heads simply cut away the old head below the last flower but not to far down as new heads will be coming through. You can leave on to develop seeds pods that will encase big white seeds, eventually these will progress to a hard black colored seed and this is when they are ready to collect viable seed for some new future hybrids. Most cultivars will produce some viable seed, while others are sterile. When Cannas are grown by seed and new hybrids are created even if they appear the same in color and form they are not and therefore should not be called by its parents name as they wont carry the same strains, characteristics, vigor etc. The only way to get an identical plant is in the form of a division, you may get some beautiful colour combinations or something similar with seeds. The end of winter is the best time to prune cannas as the foliage will be burnt from heavy frosts. Simply cut right down to a foot of so -once you reckon the chance of any late frosts has passed. As the weather warms up foliage growth will recommence. Rhizomes are active all year round only foliage growth slows right down during winter but the underground rhizome is still very active forming new eye growth. Mid winter divisions with little rhizome attached are best potted with good drainage and planted out early spring. Lift and divide your cannas every 3 years or so and replant the best divisions that have a sizeable rhizome attached as this is where its starch/food source is stored and they will bounce away in growth for you. Over summer and through our drought conditions my cannas thrive on grey water, shower water and dam water when time is permitted to pump and cart it, I also use a bowl under kitchen tap to collect sink water from table wiping etc, and use this to water my plants, gone are the days of turning on the tap, with water so scarce cannas have proven to be a very versatile plant to grow.